How does this anti-allergy device work? Caremaxx Bionase treats allergy and hay fever symptoms with light therapy, also known as phototherapy. Hay fever and allergies are caused by an allergic reaction in response to otherwise harmless substances such as pollen or animal fur. This causes symptoms such as repeated sneezing, nasal congestion, a runny nose and itching. These symptoms are usually treated with (antihistamine) medicines. Light therapy can be a good alternative for people seeking a natural treatment. The Caremaxx Bionase device emits infrared light into the nasal cavity. The infrared light makes the nasal mucous membranes less sensitive to triggers such as pollen of flowering plants and trees, dust mite, animal fur and other allergens. This helps reduce nose irritation that occurs in response to hay fever or other allergies. Light therapy can also be used preventatively before exposure to pollen or pets to avoid symptoms. 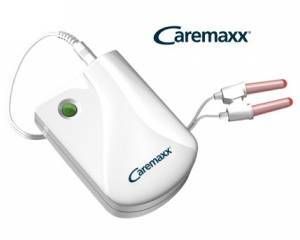 The Caremaxx Bionase anti-allergy device consists of a nasal applicator that is connected to a small appliance with a cable. It is important that you read the manual before using the device for the first time. The manual will tell you how to prepare the unit for use. When you are all set for your light therapy, insert the LEDs into the nostrils. Then press the ON button and begin light emission. Light emission will be ended automatically after four-and-a-half minutes. Carry out the treatment for one to two weeks, three times a day. In principle, this should be enough to ease your symptoms. No side effects: your body is not burdened with chemicals. This means you don’t have to deal with the side effects of hay fever medication such as tiredness and sleepiness. Treatment anywhere, anytime: light therapy treatment is very easy and can be carried out anywhere, anytime. The Caremaxx Bionase device is a small, battery-powered unit that you can easily carry with you. The nasal applicator is easy to clean and is therefore suitable for multiple users. Inexpensive: the Caremaxx Bionase anti-allergy device will give you years of light therapy, which makes it cheaper than medication. Safe: the Caremaxx Bionase anti-allergy device has been thoroughly clinically tested and fulfils all safety requirements.